Or... "How many flatlays can I fit in one post?" So! 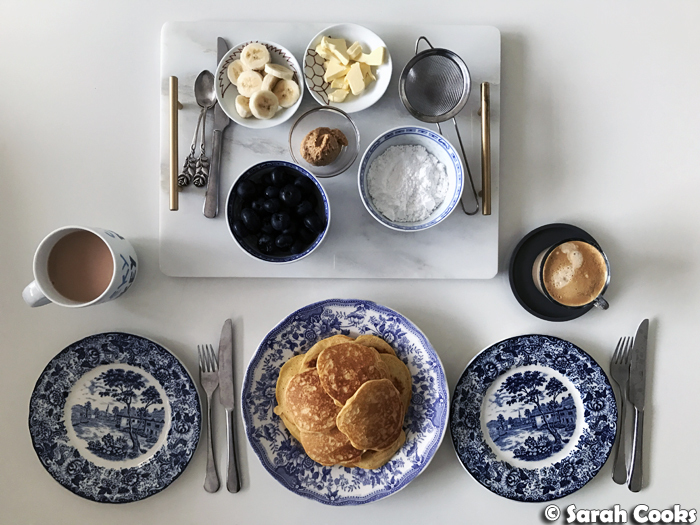 Back when I made those banana cottage cheese oat pancakes, I told you how I really wanted to make cottage-cheese-and-oat pancakes, the "healthy" kind that are beloved of fitness bloggers and general clean-eaters. And I did! And they're so, so very good. I now make them regularly for a treat of a weekend breakfast. 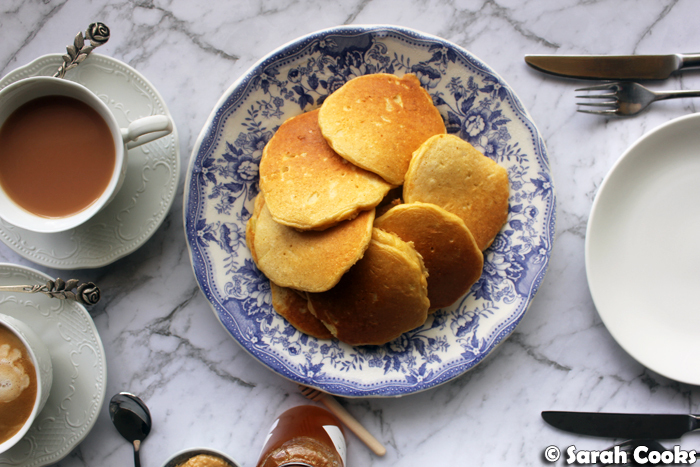 These pancakes are basically just oats, eggs, and cottage cheese, all blended together. So simple! I add a little baking powder, for fluffiness, and cinnamon and vanilla, for a comforting aroma and flavour. Sometimes I add an apple to the batter, peeled and cored and chopped up into little cubes. But whether I add apple or not, I always fry them in butter because delicious! Obviously you can fry them in whatever oil you like, or just use a good non-stick pan and forgo the extra fat. (*Whispers* Don't forgo the extra fat). As I've told you previously, Sandra's really into healthy eating and exercise, and is always trying to keep her protein intake up to support her training. (I vacillate between periods of enthusiastic exercise and general lethargy, but am happy to have an excuse to eat more mindfully). With the cottage cheese and eggs, these pancakes are naturally really high in protein, with 18.6 grams of protein per serving (I used this recipe nutrition calculator to figure it out). Protein powder pancakes are a thing; I have no interest in those. In my experience, this recipe serves two generously, but I have seen recipes online that make a similar quantity and say it serves one. I have no idea how anyone could eat that much. Who are you, The Rock? 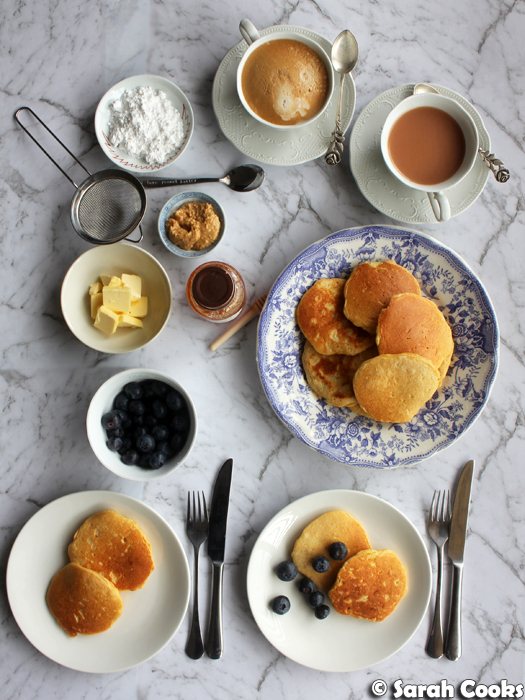 However, for all their nutritional credentials, they don't taste eggy or heavy or dense or wholegrain-y or protein-y, they're just delicious light and fluffy pancakes. 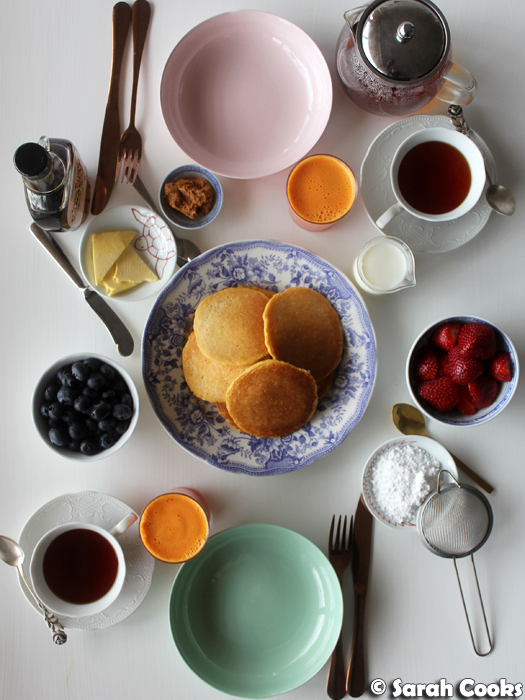 I don't think of these as a healthified imitation of pancakes, these are simply my favourite pancakes to eat. I like these with butter, peanut butter (I could pretend it's for the added protein boost but y'all know I just eat PB because I love it), blueberries and maple syrup. Sandra simply blankets them in icing sugar. Ahem. Place all ingredients except butter in a blender and whizz to combine evenly. Heat a non stick frying pan over a medium heat and melt a little butter in it. Fry the pancakes - I like small ones, so I use a quarter cup measure and get two pancakes per scoop. Fry on the first side until bubbles start to appear on the surface. Flip and cook for a further two minutes. Place on a serving plate, tented in foil to keep them warm, while you cook the rest of the batter. 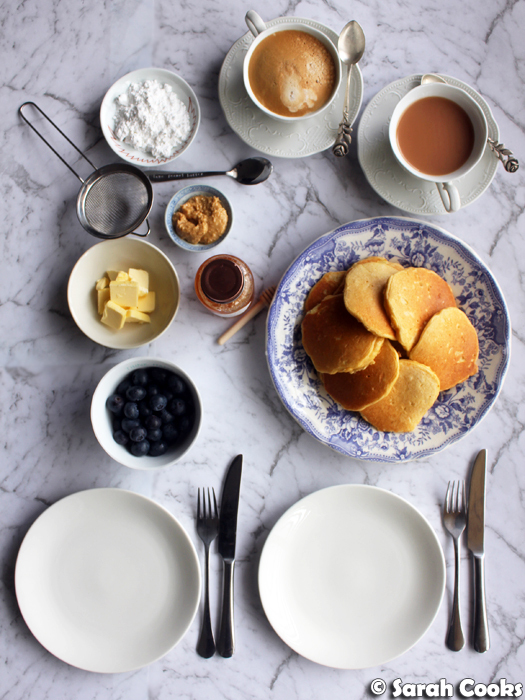 Serve with accompaniments of your choosing - blueberries, banana, butter, honey, maple syrup, powdered sugar, whatever! Ooh I haven't tried those - but I've tried similar ones, with banana, egg, and peanut butter! Yum!